The State Minister of Defence of Sri Lanka Ruwan Wijewardene visited Goa Shipyard Limited (GSL) on the opening day. During the visit, Wijewardene had discussions with Rear Admiral Shekhar Mital (Retd), Chairman and Managing Director of GSL, and other senior officers on progress of Sri Lankan vessels under construction at GSL. 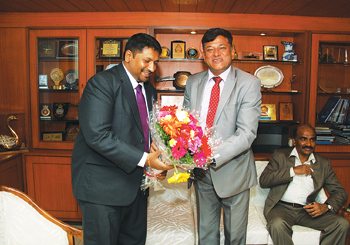 Karunasena Hettiarachchi, Secretary, Ministry of Defence of Sri Lanka, and Lt General A.W.J.C. De Silva, Commander of the Army of Sri Lanka, were also present. The Minister was conducted around the shipyard by CMD GSL and also taken to both the Sri Lankan patrol vessels under construction. The Minister took keen interest in the ongoing construction of ships and also visited CGOPV Shoor, delivered to Coast Guard on March 16. Commanding Officer Shoor conducted him around the ship and apprised the Sri Lankan delegation of the advanced features of CGOPV with reference to older OPVs. The Sri Lankan delegation expressed happiness with the progress of the work and was also shown the infrastructure augmentation being undertaken for MCMV project. Earlier a presentation was made to the Sri Lankan delegation on in-house design capability, product profile and future potential of cooperation. It is noteworthy that the shipyard is executing large export orders from Myanmar, Sri Lanka and Mauritius. Today GSL is the largest exporter of ships from country with present order book of over 1,200 crore. The second in the class, of new 105M offshore patrol vessel (OPV) ICGS Shoor built on GSL in-house design was delivered to the Indian Coast Guard on March 23, 2016, one-and-a-half months ahead of contractual schedule. First CGOPV of this series was also delivered ahead of contractual schedule. This largest and most advanced new generation OPV was handed over by Rear Admiral Shekhar Mital to DIG Surendra Singh Dasila, Commanding Officer, in presence of DIG T.P. Sadanandan, TM, Principal Director (Mat) Indian Coast Guard, DIG R.D. Shedbalkar, CSO (Tech), Coast Guard Region (W) and DIG Arun Shrivastav, CGRPS (Goa) in a simple ceremony held at GSL on March 23, 2016. S.P. Raikar, Director (Operations) GSL, Sudhakar T.N., Director (Finance) GSL and other officials of Indian Coast Guard and GSL were also present on the occasion. CMD in his message said: “The delivery of second CGOPV ahead of schedule is a landmark event for GSL. The ship was launched on March 21, 2015. Delivery of the ship in one year of its launch, as was committed at the time of launch, is reflective of yard’s shipbuilding capabilities, commitment and validation of our execution skills. CMD added that the OPV being handed over today speaks of GSL’s commitment to the ‘Make in India’ initiative of the Government of India and yet another proof of successful journey towards timely execution of the project by a proud DPSU shipyard, in perfect synergy with Coast Guard. Manifestation of this initiative will be seen more and more from GSL in times to come”. 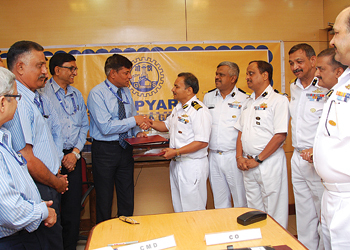 The ship has been built in supervision of Coast Guard Headquarters and CGRPS based at Goa. Due to the very strong feedback mechanism and effective supervision, the ship incorporates top-end design features and innovation by shipyard and a testament to the innate design capability of shipyard. This state-of-the-art OPV is second in the class of six OPVs being built by GSL for Indian Coast Guard. It will be the second biggest ship on joining Coast Guard fleet. The induction of Shoor will help meet the increasing requirement of the Indian Coast Guard for undertaking policing and patrolling of the vast Indian exclusive economic zone. The ship has state-of-the-art engine/machinery controls for ease of operation, advanced electronic warfare and electronic systems and gun.